NOTES: Big Boa's mouthpiece can be slightly difficult to track down. 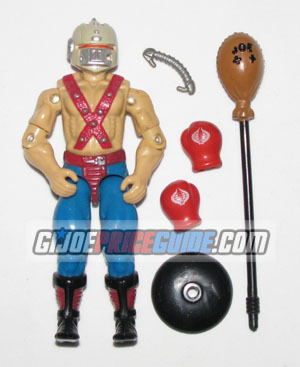 The biggest issue with a complete Big Boa will be the condition of the white cobra symbol paint on his boxing gloves. Silver paint damage commonly occurs on the belt buckle and the small spikes located on the red chest straps. Some of the black paint from the punching bag is often missing as well. Rumor has it that Big Boa was made to be Cobra's answer to a Sylvester Stallone Rocky figure which never made it to production. This is the only version of Big Boa.